If you’re looking for high-protein breakfast ideas, most people will tell you to just add eggs. Sure, there are countless ways to prepare them: scrambled, fried, boiled, omelette. But assuming you're not Gaston, you're probably going to crave a little more variety. Thankfully there are plenty of other great options when you need your protein fix. Looking for other ways to get a protein-packed breakfast? Here are some of our favorite high-protein breakfast ideas … that aren’t eggs. 2% Greek yogurt is a breakfast champion. Not only is it high in protein, it is also low in calories and packed with gut-healthy probiotics. Plus, it’s a blank canvas that can be prepared a number of ways. Keep it simple and toss some nuts or berries on top, or get fancy and make a parfait with layers of yogurt, fruit, chia seeds, and granola. Greek yogurt also pops up in several other high-protein breakfast ideas ... so keep reading. Cottage cheese is an underrated stable of high-protein diets. You’ll get about 15 grams of protein from just half a cup, which makes this a worthy add-on to any breakfast plate. As with Greek yogurt, you can top cottage cheese with fruit and nuts to make a full meal. Peanut and almond butters are great sources of protein and healthy fats. Spread it on toast, mix it into a smoothie (bonus: it makes it extra-creamy), or use it to bind together homemade energy bars. Nut butters are not low-calorie, however, so enjoy in moderation. If you’re set on oatmeal for breakfast, get more protein out of it with this preparation method. The basic recipe combines 1/2 cup each of oats and milk with 1/4 cup of yogurt. Mix in any other ingredient you like, like berries and nuts. Leave the mixture in the fridge overnight, and it’ll be ready for you in the morning! Pancakes are a brunch staple, but the next time you get out the griddle, trying a variation with extra protein. You can substitute almond flour for all-purpose, eggs for milk, or even add in protein powder. Check out recipe options on PlateJoy. Tofu is extremely versatile and takes on the flavor of whatever it’s cooked with. In addition to being protein-rich, it’s also a good source of vitamins and minerals. 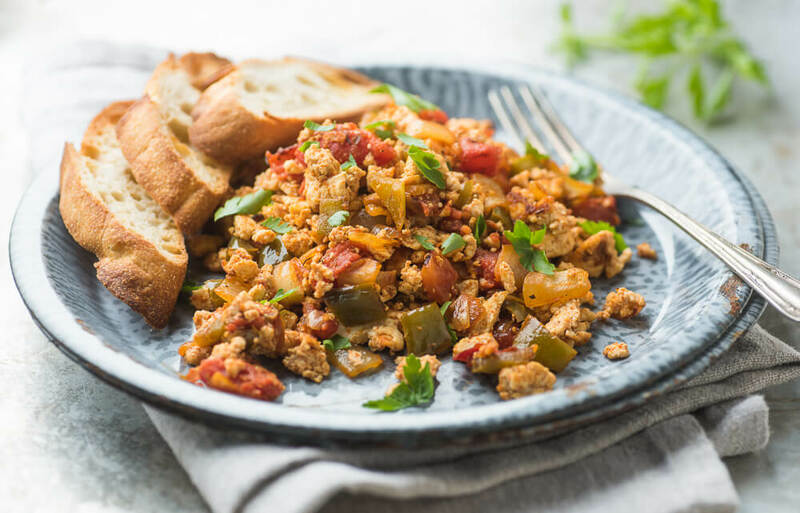 Take a break from the egg scramble and make a tofu scramble instead with veggies, cheese, or your favorite spices. Smoothies are another way to experiment with all sorts of high-protein breakfast additions. While many people will use protein powder in their smoothies, you can also blend a lot of the protein-rich ingredients listed above to make a delicious smoothie. Frozen banana, peanut butter, milk, and Greek yogurt? Yum. Whole grain toast on its own doesn’t pack in a lot of protein, but there are plenty of great toppers that will do just that. Combining protein with carbs also helps slow your carbohydrate absorption (which reduces blood sugar spikes). In addition to cottage cheese, try ricotta and goat cheese on your toast (they taste great with sliced apple). Hummus can also be a good source of protein, especially if topped with nuts and seeds like sunflower kernels or pistachios. Or do toast the English way: baked beans on toast! Lean meat is another great way to get protein into your morning meal. This item pairs well with a number of other savory items like toast, tofu scrambles, and cottage cheese, making it even easier to bulk up the protein count in your breakfast.